← 10 x Hopelessly Lax = ? There is a lot of interesting stuff in the latest IMF Financial Stability Report. 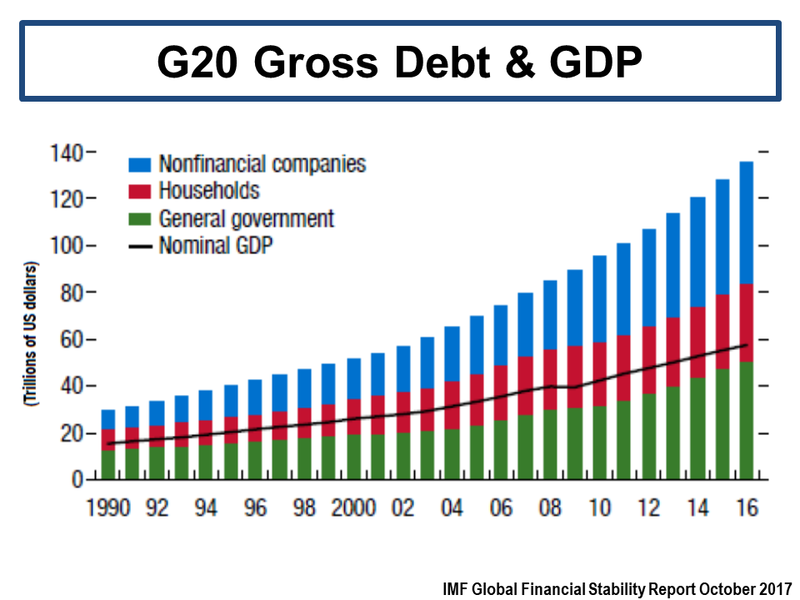 After much research on global debts levels (as per this post in 2014 and this one in 2015) over the past few years, the graph below on G20 gross debt levels from the IMF shows how little progress has been made. When looked at by advanced economy, the trend in gross debt from 2006 to 2016 looks startling, particularly for government debt. 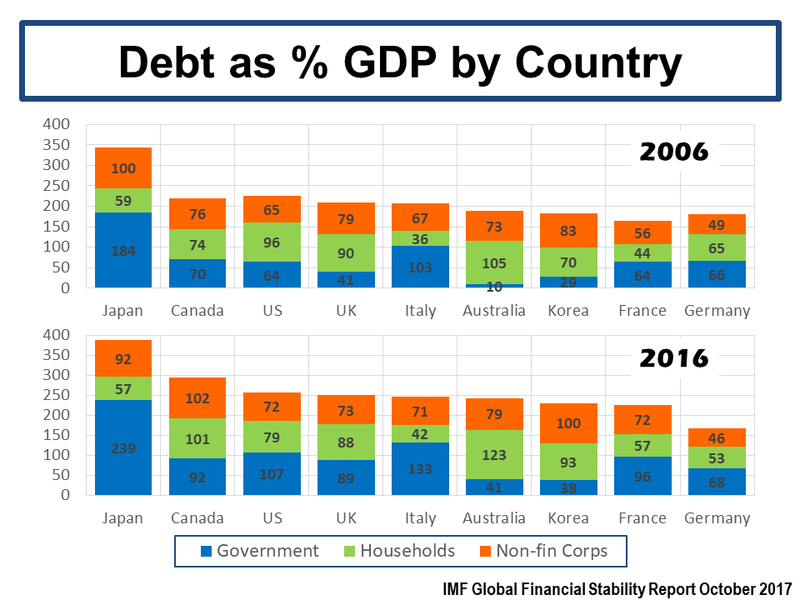 As the IMF state, “one lesson from the global financial crisis is that excessive debt that creates debt servicing problems can lead to financial strains” and “another lesson is that gross liabilities matter”. The question does arise as to the economic impact of these debt levels if interest rates start to rise across advanced economies? This entry was posted in Economics and tagged capital banking sector, China rising debt, credit crunch, Debt and (not much) Deleveraging, debt bubble, debt dependency, deleveraging, deleveraging and slower nominal growth, Geneva, global capacity, global debt to GDP, growth rates deleveraging, household debt, IMF Financial Stability Report, McKinsey, private sector, public sector, public sector debt, re-leveraging, real output and lower inflation, world growth and inflation. Bookmark the permalink. Deleveraging? What deleveraging? Imho central banks are (almost) nowhere in a position to raise rates meaningfully… which makes my wonder whether inflation expectations could become unhinged at some point in time (which should lead to higher nominal rates and steeper curves irrespective of what central banks are doing). Nice article in last week’s economist about bubbles in all assets, think it called bubble without fizz, looks like housing issues in Canada & Australia! !